I am in no mood to ramble today because I've not been feeling too well. Took a long bath which was supposed to refresh me, but instead I'm feeling more lethargic. Have so much of work to complete and deadlines to meet but I have just been sitting on it. I started this blog post a couple of days back, and keep writing bits and pieces here and there. So today I finally decided to finish it off. At least I can console myself saying I have finished a blog post. Coming to the recipe... If you ask me what my comfort (Indian) meal is, I will go for rice, dal, potato fry, pappad and pickle. I can seriously live on dal for any number of days. But for someone who loves dal, I actually don't make it that often. I wonder why. Anyway, I derived inspiration to make this dal after Finla posted her version. 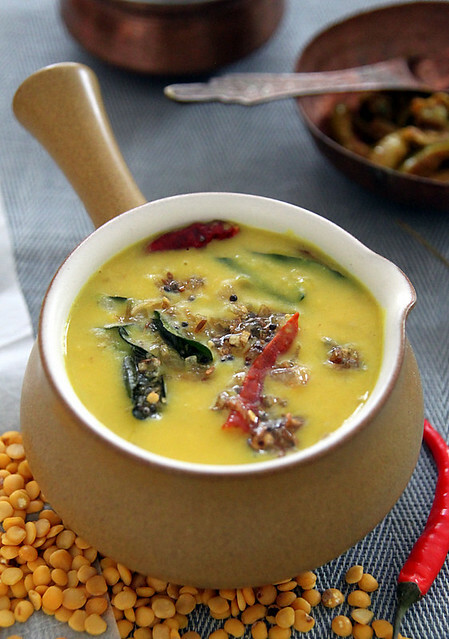 I love dal with coconut in it and the tedious traditional way to do this would be to grind dessicated coconut with a whole bunch of other ingredients and add it to the dal etc etc. I have tried that version as well, but this kinda fetches the same, or even better results with the use of just coconut milk. The recipe is from the book The Kerala Kitchen by Lathika George, a book I stashed away because of a couple of recipes that gave me disastrous results. I found that the masala's mentioned were way way way too much for the said quantities of meat and the book has no pics, which makes it boring and incredibly difficult for me to figure out what the end result should be like. So when Finla posted the recipe with the pic, I couldnt say no. It looked way too good to pass and I decided to give it a shot soon after. I was not disappointed, so yes, I must admit that the book does have its plus points after all. 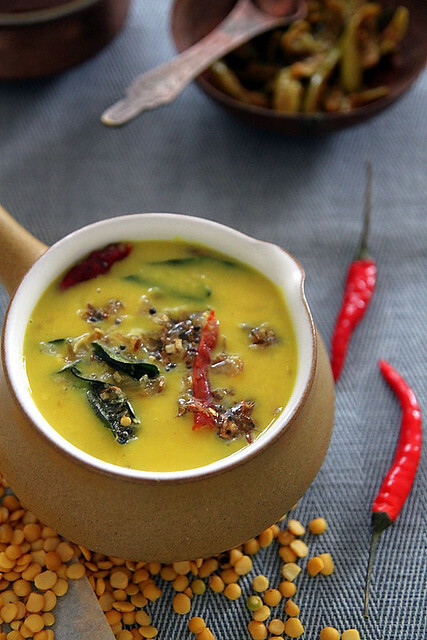 Cook the dal with water, thin coconut milk, ginger, green chillis, turmeric powder, cumin powder and salt in a pressure cooker. About 2 to 3 whistles on medium heat should be fine. The lentils should be cooked, but not too mushy. Take the cooker off the flame, release the pressure, open the lid and pour in the thick coconut milk. Give a thorough stir. Keep aside. Heat the oil in a kadai and throw in the mustard seeds. Once they splutter, follow up with shallots and garlic and fry for about a minute or so, till just when they start browning. Add the curry leaves and dry chillies, stir around a couple of seconds and take it off the flame. Notes: Original recipe calls for split pigeon peas, but I didn't have any so used toor dal instead. If you don't own a pressure cooker (first of all, buy one), do the cooking in a large pot. It might take longer, but it can be done. In that case, once the dal is cooked, take it off the flame and add the thick coconut milk. While reheating, make sure you don't let it boil. I froze the remaining dal and it worked out perfect. Just thaw it completely before reheating it on low fire. **thick coconut milk on the other hand is thicker and much more creamier. If I don't shake the canned coconut milk to mix it up, when I open it, I find a thick layer of coconut cream. I dish this out immediately and use it to make the thick coconut milk, by just diluting it with a few spoons of water or the coconut water collected at the bottom of the can. I love dal with ground coconut in it as it reminds me of Sadya's. It's one thing we always had on Good Fridays at home, with a big blob of ghee too! Dal and Sambhar is the staple at our place - I do all the permutation and combinations with the Vegetables available..But this time I was also gawking at your pics - composition, color contrast and texture :) Very Beautiful! Beautiful clicks dear..Its my hub's all time fav...yumm. Very tempting and yummy looking curry. Your snaps are excellent. healthy and simply delicious curry! !pot looks very cute dear! the pic looked toooooo delicious on Fb i had to read the recipe.. am definitely trying this soon! well i hv never tasted dis kinda daal...but this luks really tempting...wil try now for sure !!! 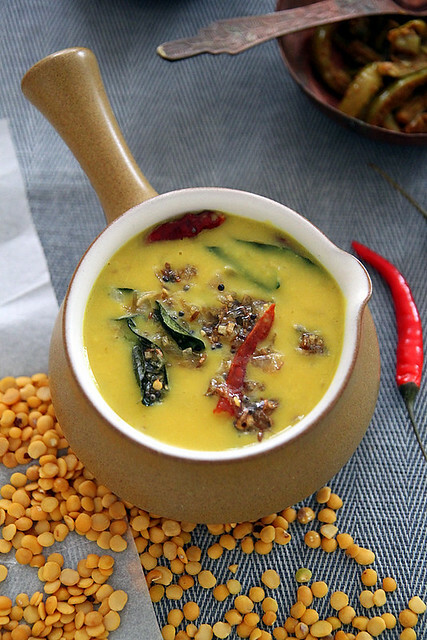 I love Dal and Coconut combo...we bongs normally mane chana dal or moong dal with coconut bits in them...now i want to try this version as it's looking super yum in the pics! one of my fav recipe from her book :-)...You have presented it so well Nisha...Long baths makes me sleep and especially when i use some perfumed oils ;-)..Loved the bowl ( ah what is it actually ?) looks so pretty..
the pic is beautiful....chana dal is tastier than toor dal but more gassy as well. love that tiny (not so tiny) pot...nice buy! just the pic alone screams of comfort meal :) i am not a huge fan of coconut milk in anywhere except thai green curry, but the recipe is tempting. This looks so good. What do you mean by "thin coconut milk"? Is that like the "light coconut milk" that comes in cans? Is it possible to just dilute regular coconut milk with some water instead? Love this recipe and the fab photos too. 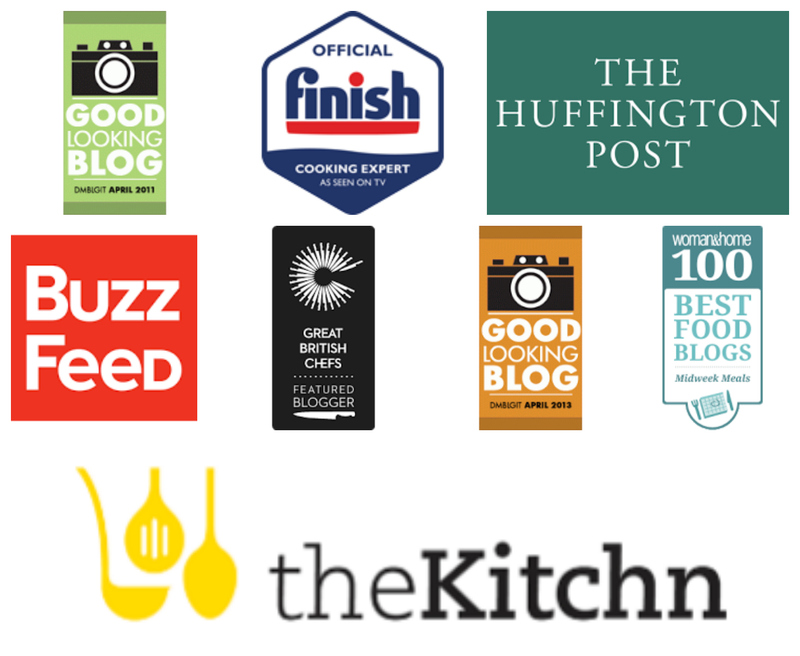 You are welcome to join in my food blogger event at THE SOUP KITCHEN, here all bloggers are welcome too, hope to see you participate soon. I HAVE to try this recipe! I am a dal fan!! And this looks super delish! And yes, gorgeous photographs!!! I LOVE that pot! WOW..I love this..Thanks for posting itnice space vth wonderful recipes n awesome pics Dear..
i agree when u say books without pix are boring....so hard to figure what the end product will look like. I have not not tried tur dal with coconut milk. I am sure it must be delicious. The photographs are beautiful. Beautiful presentation Nisha.. Dal with coconut milk is neww to me.. have to try it sometime. Dal looks really luscious! I've never used coconut milk in dal preparation. But it sounds interesting! Hey Nisha, I made this yesterday for lunch and LOVED it!! This is going to be a regular in my menu from now onwards, thanks for sharing the recipe! 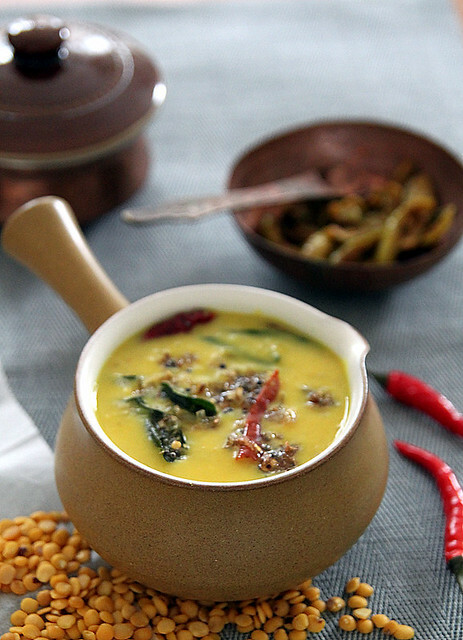 Every time I come to your blog Nisha, I am lost in the recipes :) .. Bookmarking this one for my next dal prep.